Note that you can only run one EA per chart in MT4. If an EA is already running on a chart, adding the trade terminal will replace the existing EA. To run both the trade terminal and another EA, simply open more than one chart. Trading terminal completely occupies a full chart window. 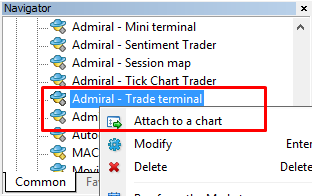 To prevent losing customisations and settings you may have made on your current chart, make sure to open a new one to run the trade terminal in. You can hide the account info and order list by clicking the respective double arrows in their title bars. This gives maximum space to the market watch. You can also manually adjust the size of those three windows to optimise spacing for your individual purposes. To do so, click on the frame separating two windows and drag it accordingly. The trade terminal shows all activity on a trader’s account, not just orders placed using the trade terminal itself. 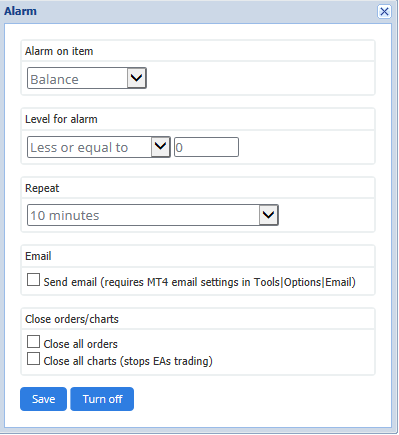 For example, if you are running an automated system or manually place trades using MT4’s own built-in features - this activity will be displayed in the trade terminal’s account summary and order list. The market watch displays a trading widget like mini terminal for each symbol. Each one of these behaves in a very similar way to the on-chart mini terminal, which is described in a separate manual. The symbols in the trade terminal’s market watch, synchronise with MT4’s own market watch. In other words, to add or remove symbols from the trade terminal - you add or remove them from the MT4 market watch. The trade terminal will then synchronise its list within a few seconds. Note that the speed and processor usage of trade terminal depends on the number of symbols being displayed. Excessive processor usage can cause delays for order placement or closing input. You can place a buy or sell order for each symbol on the market watch using the Buy and Sell buttons. The status indicator at the top of each widget shows your current net position for that symbol, e.g. +0.10 if you are long 0.1 lots, or -0.10 if you are short 0.1 lots. 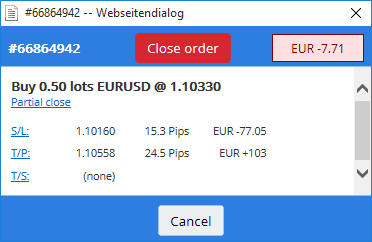 You can control the lot size on new orders, set a stop-loss, take-profit or trailing stop - by using the fields above the Buy and Sell buttons. You can open a trade calculator for each of these fields, by holding down the ctrl-key and left-click the respective field. 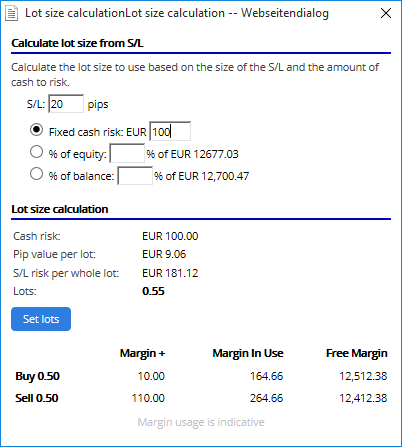 ctrl+click into the S&L field to open a calculator and let the system calculate the exact amount of pips. If an exact calculation isn’t possible due to trade size restrictions (e.g. exclusively full lots for CFDs), the system will round down approximately. The calculator provides information about the margin requirements of your new order, if you ctrl+click the lot field. You can place pending orders (limits and stops) by clicking on button and choosing New order. It is possible to choose the order type and entry price, stop-loss, take-profit etc. the limit order is created 20 pips below the current price. The new order form (accessible via button), also allows you to place OCO orders. There are two types of OCO orders. OCO breakout lets you specify two prices, or two values in pips, either side of the current price. The mini terminal will place a buy-stop and a sell-stop accordingly. Once one of the pending orders is filled, the other is automatically cancelled. You would typically use this when you are expecting a major price movement, but don’t know whether the direction is going to be up or down, e.g. news trading. Many trading strategies are based around trading the breakout and this functionality offers a convenient interface for it. OCO reversion informs the mini terminal to place a buy limit and sell limit, rather than a buy stop and sell stop. You would typically use this if you expect a move in either direction, followed by a return towards the current price e.g. a bounce off yesterday’s high or low. click Save template button and choose a name for the pre-set. your order will automatically be executed. Note that the program will not request further confirmation if you place orders this way. To close an open position, click on the position marker at the top of the mini terminal (the text reading +0.10, -0.50 etc) and slide open a panel of options. The panel shows the profitability of your order in cash and pips. 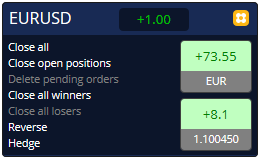 The price below the profit in pips, is the position’s average entry price if there is more than one open order. Here you can opt to close all the symbol’s open orders (all winning or losing trades), or to hedge or reverse the open position. Hedge – opens an order of identical volume on the opposite side of the market, without closing the current one. 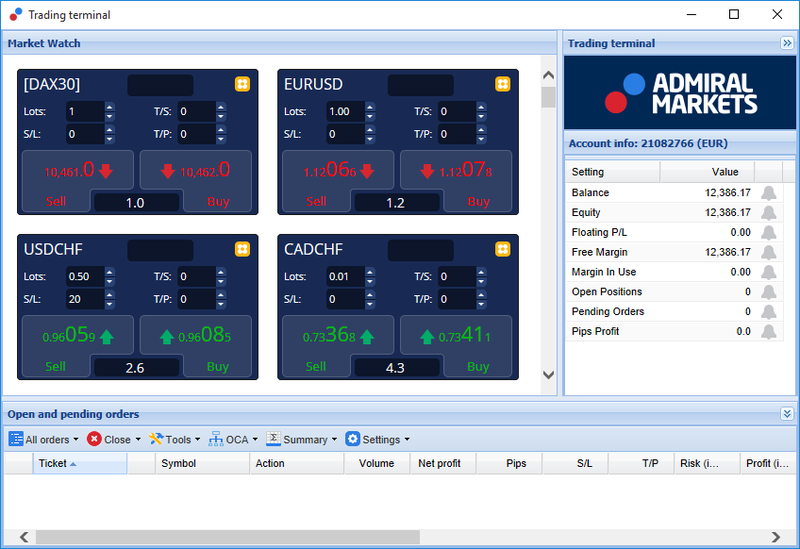 You can close individual orders with the regular MT4 window, or use the new mini terminal’s various settings, extensions and pre-sets. You can view symbol information by clicking on button and choosing Symbol information. 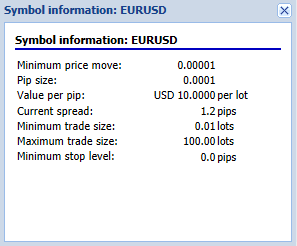 This opens a window showing the minimum price movement for the symbol, plus the minimum and maximum trade sizes etc. You can open a new chart window, by clicking on button and choosing New chart. 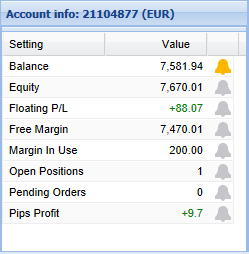 The account summary shows key information about your account - like balance, equity, floating P/L, free margin and number of open positions. when the number of positions is zero (i.e. when all positions have been closed). 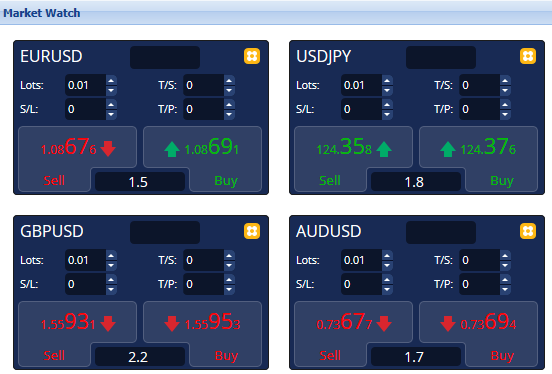 Alarms are displayed as pop-up alerts in MT4 and can also be sent to you by email. When an alarm is created, the colour of the bell icon changes to yellow. If an alarm is then subsequently triggered, the colour changes to red. enter value 2 for the alert and choose the option Not equal to. Alerts can be set to turn-off after they have been triggered, or they can be set to repeat. A repeat period tells the terminal to ignore the alert for a certain number of minutes. the repeat period prevents the alarm from being repeatedly triggered (every few seconds) if the free margin keeps fluctuating between $999 and $1001. You can get an optional email notification when an alert is triggered i.e. additional to having the standard alert pop up on screen. To receive an email, you need to turn on MT4’s email settings, which you can configure using MT4’s main menu - Tools > Options > Email. You can configure two specific actions to take place when an alert is triggered. Close all orders attempts to close all open positions and delete all pending orders, when the alarm is triggered. It would typically be used in relation to an alert on free margin, where you want to close out your positions to prevent a margin call. Close all charts closes all MT4 charts apart from the trade terminal’s own chart. The main purpose of this is to prevent automated systems (EAs) on other charts from placing further trades. The order list displays all open positions plus pending orders on your account and provides the tools for managing those orders. 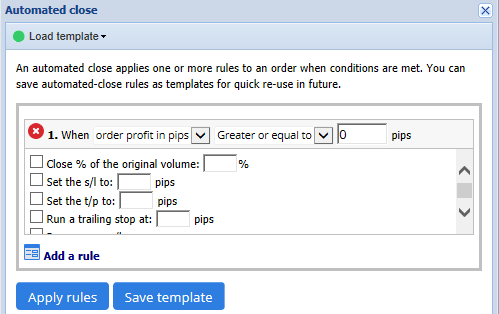 It replicates the information from MT4’s own order list and includes some extra details like trade duration and profitability in pips. If the icon next to an order changes to , it indicates that the trade terminal is carrying out automated actions on the order e.g. the order might be part of an OCA group. You can check which actions are being processed, by clicking on the icon and choosing Tasks in progress. You can sort the order list by any of its columns. Simply click on a header such as Ticket, to sort in ascending order. Or click again to sort in descending order. You may also re-arrange columns in the list by dragging the headers. Just press and hold down the left mouse button on a header, then drag the mouse pointer to the new location where you want the column. Additionally, you can show / hide columns, by clicking on the arrow next to a column and choosing which one to show or hide in the column menu. You can close an open position or delete a pending order, by clicking on button next to it. 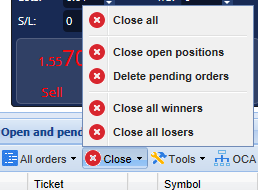 Close all losers – closes all open negative orders. You can carry out a number of actions on orders including partial close, change S/L and set a trailing stop. click the symbol in a summary window. You can select several orders from the list to carry out specific actions on just the selected orders. The order list follows the standard behaviour for Windows applications. Clicking on an entry, selects that row only and deselects previously selected entries. click on item two and shift+click on item four. ctrl+click on the order you want to leave out. Once you have selected some entries in the order list, you can use the Selected orders option in the Tools menu. This function is disabled if there are currently no orders selected. set/modify its stop-loss (S/L), its profit target (T/P) or its trailing stop (T/S). The values for stop-losses and profit targets are specified in pips, though the S/L and T/P can also be set to break-even i.e. the order’s entry price. A partial close cannot always be processed exactly. For example, you cannot do an exact 50% partial close of an order for 0.03 lots, because 0.015 lots is not a permitted size. Partial closes always round down to the nearest lot size permitted by your broker. an order for 0.02 lots. Please note that trailing stops are processed by the trade terminal software, not your broker. The trailing stop will cease operating if you close the trade terminal (or MT4). You can also open a pop-up window for each order by clicking on its ticket number or by clicking on the icon and choosing Edit. the cash effect on the balance if the S/L or T/P is hit. The current profit for the order is shown in the top-right of the window. It can be switched between cash and pips display by clicking on it. 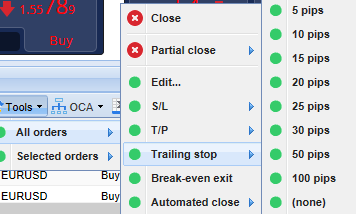 You can close the order using the red button and change the S/L, T/P or trailing stop by clicking on the respective options. Automated closing lets you define rules for exiting an open position. These can consist of multiple parts (e.g. scaling out of a position when profit thresholds are met) and can include visual plus email alerts. Automated closing can also be saved as a template for quick re-use in the future. Note that automated closes are processed by the trade terminal software, not your broker. They will cease operating if you close the trade terminal or MT4. Edit if there is already an active automated close on the order. At the top of the Automated close form, you choose the threshold when this rule is applied. You select the criterion - such as the order’s profit in pips or duration and the value for the threshold. For example, to carry out an action once an order has been open for an hour - you choose Order duration, greater or equal to and enter the value of 60. For every closing condition you set, you can define a number of actions such as closing part or all of the order, setting a stop-loss or trailing stop, or sending an alert by email. Simply tick the box next to each action you want to be carried out and fill in the corresponding fields, such as the percentage of the order to close. Please note that the percentage of an order to close, is specified in relation to its original size - not the current size following any previous partial closes. the order will be completely closed when the second stage is reached. selecting the template from the sub-menu. You can organise your list of saved automated close templates and remove any you need no longer, by choosing Manage templates from the sub-menu. Note that the program will not request further confirmation, if you place orders this way. The trade terminal lets you create an OCO group of pending orders – where all the remaining orders are automatically discarded, when one of the orders is filled. An OCO order is simply an OCA group, where there are only two orders in the group. 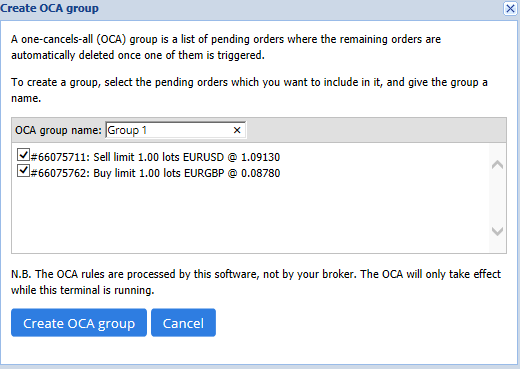 Please note that OCA groups are processed by the trade terminal software, not your broker. They will cease operating if you close the trade terminal or MT4. You create an OCA group by choosing Create OCA group from the OCA menu. This option is only available if you have at least two pending orders. Simply choose a memorable name for the group and tick the pending orders you want to include in it. A single order can belong to multiple OCA groups and orders in a group can be for different symbols. You can delete an OCA group by choosing Delete OCA group from the OCA menu. Note that this does not delete the pending orders - just prevents the trade terminal from running the OCA rule on those orders. 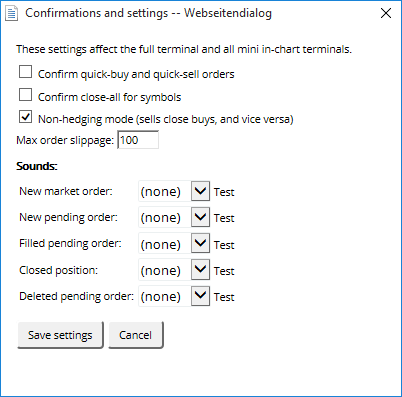 You can control the settings for the trade terminal (and subsequently all copies of the on-chart mini terminal), by choosing Confirmations and preferences from the Settings menu (in the toolbar above the order list). Hedging mode - the trade terminal’s default, which is the standard behaviour for MT4 as a whole. If you place a buy order and then place a sell order for the same symbol (or vice versa), the software will create two open orders. However, you can also choose to run the software in non-hedging mode. If you have an open buy order and you place a sell order - the sell closes the buy rather than creating a new order. you will be left with a buy order for 0.2 lots. Usually, the deactivated hedging can be used to close orders faster. Clicking on the interface button representing the order type currently not open, allows the user to close or partially close the open order. If hedging was activated, it would merely open new orders. The Test button allows you to play-back the chosen sound. Make sure to save your settings, or they will be discarded. This allows you to trade from multiple monitors at the same time. You can undock the trade terminal into a floating window, by clicking on Settings button and choosing Undock terminal. You can continue to trade while the terminal is undocked from its chart. To re-dock the terminal, click Tools button again and choose Re-dock terminal. Alternatively, you can change this setting when activating the trade terminal. To do this, change into the Inputs tab and setting UndockAtStartup to true. Feel free to visit our English YouTube channel, which represents live trade recordings, tutorials, a trade terminal tutorial and playlists of extension-highlights.